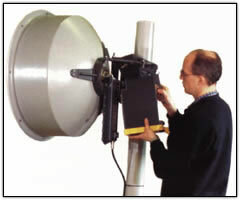 Supercompact SDH microwave radio transmission equipment in the 18Ghz, 23Ghz and 25 Ghz bands. With remote software download. Inspite of the very small design, no compromise has been made. Citylink is a truly professional STM-1 radio (155Mb). Typical applications, ATM Networks, infrastructure for cellular networks, access sections in the SDH network, closure of the fibre optic rings, LAN/WAN connections.